But within moments, I backpedal. I hope I sound disappointed — and truly, I sort of am. He's easy on the eyes, sweet, and a little goofy. He loves running and trying out new cult workouts as much as I do. Later that night, I did attend a happy hour, of sorts. It was in my kitchen, but there was only one other guest: my faithful smoothie. “Hey, do you want to grab a bite tonight?” a fellow Barry Bootcamper asks me as I'm leaving class drenched in sweat. He's dreamy, 6'2", and just how the Texas-raised girl I am likes a man: big and brawny with strong arms to envelop me. I've been vying for his attention for months with a combination of subtle smiles and random questions about my treadmill stride. He might have been something, but my smoothie is my everything. And I can't wait to get home. Smoothies are easy. Relationships, not so much. And dinner, or any meal for that matter, means that my freakish behavior around food that's been 30 years in the making has nowhere to hide. What is supposed to be enjoyable becomes a logistical nightmare: Where will we go? What will I eat? What if I'm not hungry? What if he wants to share fried calamari, a bottle of wine, or a dessert? What if he asks me to take a bite of something that's not on my approved list of foods? Most of all, will it be as safe as a meal alone? I grew up in a house where I didn't feel safe eating. My mom was a foodie and a personal trainer, and taught nutrition at the community college. From low-fat to sugar-free to high-protein, she was on the cutting edge of diet trends, and my family's eating habits followed suit. I often overheard my mother counseling her clients on the phone. “Make sure you're sitting down for a veggie-rich meal with an 8-ounce glass of water.” I absorbed these conversations as “food rules” and made them my own. My father was also extremely active, spinning five days a week at 5:45 a.m. no matter what. We were an extremely healthy, active family. We didn't sit around watching TV; we were always physically doing something. The unspoken truth in my family was that "fat" was unhealthy, lazy, and bad. At age 6, I looked down at my thighs and thought they were too big, and I, along with my two younger sisters, developed unique combinations of eating disorders. From then on, I danced with the scale, shuffled food around the plate, and calculated my worth based on my calorie intake. Most days, I was a good anorexic, restricting myself to iceberg lettuce, chicken broth, fat-free yogurt, and turkey with mustard. But I liked to eat too much, so when I failed at starving, I ate what I wanted and threw it up. My style of bulimia was all about the purge; the violent expulsion of the food I consumed was how I expressed all the feelings I kept inside, both good and bad. I was a sensitive empath who took in everything around me, so eating was uncomfortable if I was overstimulated. Nothing would shut down my appetite like a big feeling, and in a home with four women, the air was saturated with feelings. I couldn't feel physically full and process strong emotions at the same time. There literally wasn't enough room for both food and feelings in my body. Purging became my go-to to calm my hyper-active nervous system. It numbed me and kept me free from having to feel. When I empty, I was safe. I never went to an inpatient rehab, but I should have. However, through eating disorder groups like Overeaters Anonymous, an army of doctors and nutritionists, and good, old fashioned prayer and meditation, I learned to eat. I started to believe that food wouldn't make me gain weight and that I could handle life with a little something in my tummy. In fact, I needed food to manage life. But giving up my relationship with my blender, almond milk, protein powders, and frozen fruit has been more difficult. The thick drink I like to think of as food has been integral in my recovery. My nutritionist suggested smoothies as a delivery vehicle for calories because you can put as little or as much nutrition as you can fit into the blender. I've learned how to jam pack a smoothie with the nourishment I need, and I don't feel too full. But what has helped me in my recovery has hindered me in relationships. If I ever let anyone in on my addiction, I'm afraid they'll walk away. They might want to help or change me. Or worse, they might want to join me in my smoothie ritual. I wish I knew as much about the ingredients for relationship and intimacy as I do about smoothies — the frozen bananas, the ice cubes, the protein powders, the gentle curve of the perfect spoon. With smoothies, the choice is easy: chocolate or vanilla. But it doesn't taste nearly as good as love does. One thing I know: Smoothies are keeping me single. They keep me away from the beautiful uncertainty of getting to know someone. And as I rush home from work, from a run, from a coffee date with girlfriends where I pine after one guy or another, all I know is that my smoothie doesn't ask questions, doesn't get in my space, doesn't kill my vibes. Most of all, a smoothie won't ever let me down. That said, a smoothie can't hug me after a long day, have coffee with the paper on Sunday morning, or hold me in bed. You see, addictions can't survive being shared with others. They thrive on secrecy, alone-ness and shame. Having a smoothie for dinner is no big thing, but it's the shame I felt about it that made it so isolating. It's that the role it took in my life trumped real relationships. 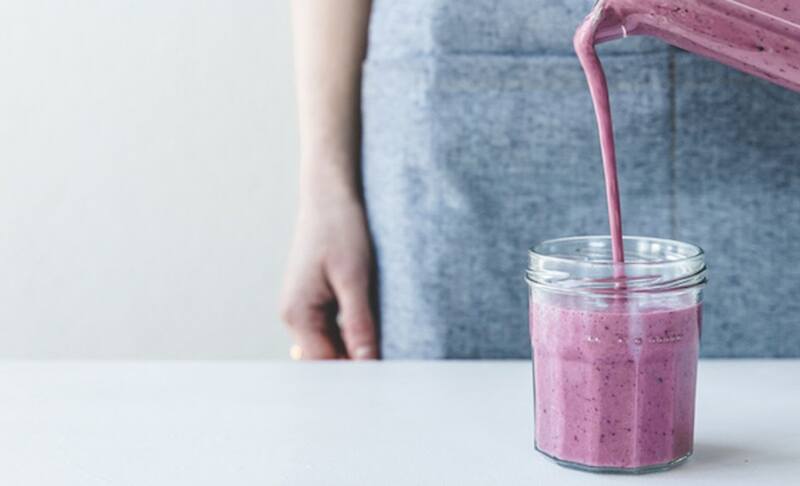 I don't have to say goodbye to the creamy goodness that has nourished me in more ways than one, but I do have to change the role the smoothie plays in my life. It can't be my closest relationship. I need to be willing to invite people into my smoothie-making madness. That is, if I don't want to remain alone. Each day I say no to smoothies alone, I am one day closer to the connected, intimate relationship I want. I know it's going to be messy and full of unpredictable feelings, but surprisingly delicious — ultimately more tasty than what I can whip up on my own.